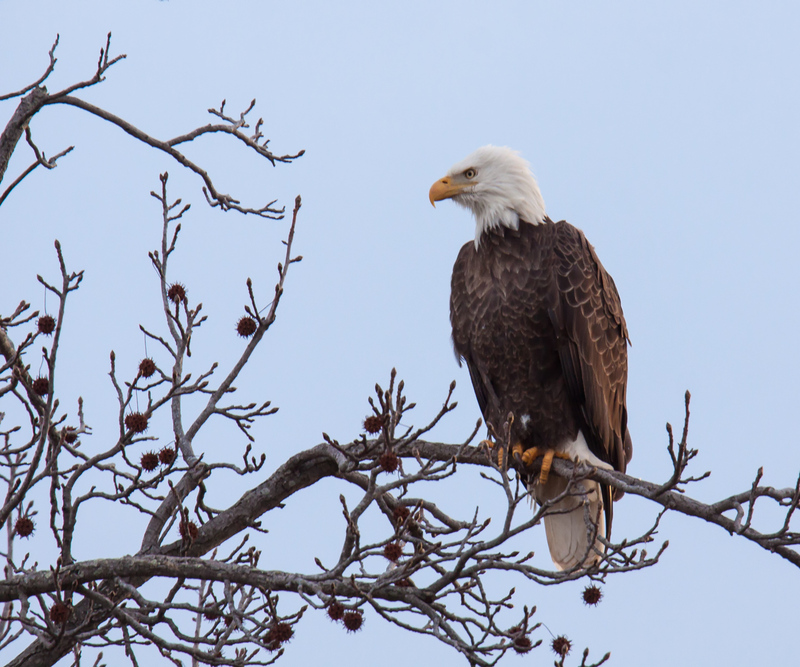 As I rounded a curve on a trail yesterday morning at Occoquan Bay National Wildlife Refuge, I looked up and realized there was a Bald Eagle (Haliaeetus leucocephalus) right in front of me. I reacted pretty quickly and managed to capture this image before the eagle spotted me and flew away. Most of the time when I have been in similar situations, the eagle has spotted me before I spotted him and reacted before I did. In this case, I suspect that the eagle was either distracted or was looking in another direction when I first came into view. That’s so wonderful! Out of curiosity, is that pretty much as you took the shot or is it quite heavily cropped from the original? Just curious as the composition is great and you were in a hurry when you took it! I cropped in a little on both sides so the eagle was a bit larger in the shot, but the composition is pretty much what I started with. I actually had time to take a series of shots, but the eagle was facing at least partly away from me in most of them. You did really well to get this one.. its great! on January 29, 2019 at 9:02 pm | Reply L.W. Couldn’t get much better than that! Thanks, Linda. You know how much I love to wander about looking for photo opportunities like this one. Wonderful capture and experience, Mike!